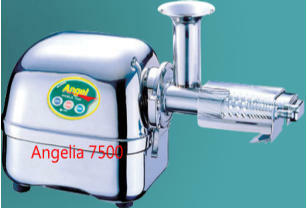 Angel Juicer 7500 Page latest models is Angelia 7500 series use SHG technology (Shattering Helical Gear Technology) which focuses on the advanced shape and angles of the teeth of the tween gears. SHG may appear to make a minor difference, but provides profound nutritional juice content. SHG measures how much nutrition can be extracted depends on how subtly the juicer can grind. (angel juicer SHG Technology for the angelia juicer series) Angel juicer 7500 series angelia juicer uses Low Speed Cone Screw Technology (LSCS). Angel Juicer latest models Angelia 7500 series use MSE (Multi Step Extracting Technology). which makes high pressure while cone shaped screw are spinning slowly to get more nutrition and juice from vegetable and fruits. Angel 7500 newest model is Angelia 7500 juicer applies 3 steps extraction technology to to get more juice and nutrition: Angel juicers 5500 series angelia juicers uses reduction gear made of SCM4 exceptional durability heat treated as used in car transmission. Angel juicer models angelia 7500 uses a cooling system to last longer and t is the pride of the new angelia juicers series. Angel juicer 7500 uses FDA approved Stainless steel to use for food handling. Angel juicer 7500 series uses anti bacteria stainless steel. Angel juicer 7500 is truly a Masterpiece timeless and perfected design. Angel juicers series angelia 7500 juicer series have been exported world wide with very happy customers. Angel juicer 7500 like all the angel juicer series are easy to operate and quick to clean-up. Angel juicer new series angelia juicers are similar to other angel juicer series have ease and quick to assemble and operate. Angel juicer 7500 provide Protection of Motor made of special material to prevent the reduction of gear from damage. Angel juicer new Angelia 7500 uses water proof button to prevent electrical leakage. Angel juicer 7500 series offers child protection devices by preventing the juicer from working when it is dissembled. Angel juicer new series angelia 7500 new model has an automatic heat sensor that stops the machine automatically when overheated. Angel 7500 series angelia juicers has triple locker switch (Power and operation switches) attached to protect children from negligent accident. Angel juicer 7500 series new angelia juicers uses electromagnetic wave blocking system to shield user from electromagnetic with acquired Australian (C-Tick) and Korean (EM/ EMS) certificates. Angel juicer 7500 uses environmental hormone free stainless steel (unlike Plastic juicers. Angel juicers 7500 series angelia juicers gained approval certificates CE, ISO 9001: 2008, ISO 14001: 2004, KC, C-Tick, EM/ EMS. Angel juicer 7500 series angelia juicers has 3H engine grinding force. Angel juicer 7500 series angelia juicer’s engine is 120-180 watts and 1/4 H. Angel juicer 7500 series angelia uses auger speed of 82 RPM which is very close to natural mouth chewing rate. Angel 7500 series has 42 mm diameter of feed chute. Angel juicer 7500 series angelia juicer weighs approximately 12 KG. Angel juicers 7500 series is designed for home use only and rated for about 30 minutes of maximum operation continuously before rest, cooling-off and cleaning. The best practice is when producing 1 to 2 containers of juice (a container is about 1000ml) to rest & clean the juicer. Angel juicer series angelia 7500 uses gears that are 220 mm in length. Angel juicer new series angelia 7500 uses gears that are 34 mm in diameter. Angel juicer new series angelia juicer 7500 can be ordered in 110-120 Voltage or 220 to 240 Voltage and either 50 Hertz or 60 Hertz Cycle. Furthermore, you can also specify the electrical cord plug shape for your country (read more). Angel juicer tries to include the desired cord type whenever possible. Angel juicer 7500 is available in 220V /50Hertz (common for Europe, Australia, UK). Angel juicers 7500 is available in 220V / 60 Hertz (limited countries use this. Angel juicer 7500 is available in 110V/ 60 Hertz (common in North America, Canada, Japan). Angel juicer 7500 is available in 110V/ 50 Hertz (limited countries use it). General Guide for Countries’ Electrical Cord Types General Guide for Countries’ Electrical Cord Types: Sample Countries Electrical Cord Types bases on previous customer orders: Cord "A" - Germany, Slovakia, Morocco (220 V. 50 Hertz) Cord "B" - USA, Mexico and Canada, Japan, Taiwan (Electricity 110V. 60 Hertz) Cord "C" or "F"- Denmark, South Africa (or E) and Russia (or F) (220 V. 50 Hertz) Cord "B" Israel (220 V. 50 Hertz) Cord "D" India (220 V. 50 Hertz) Cord "E" - France (220 V. 50 Hertz) Cord "F" - Norway, Sweden, Israel, Greece (220 V. 50 Hertz) Cord "G" - United Kingdom, Ireland, Malaysia and Singapore (220 V. 50 Hertz) Cord "I" Australia, New Zealand, Belgium , Grenada, Hong Kong (220 V. 50 Hertz) Cord "J" Switzerland (220 V. 50 Hertz) To Purchase the angel juicer new model angelia 7500 in 110-120V or for further information, please, click here To Purchase the angel juicer new angelia juicer 7500 in 110-120V or for further information, please, click here Angel juicer recommendation: We recommend you add the Stainless steel cup for the juice collection since it is properly fitted to offer better support for the long housing and gears. The optional silicon sealed pusher is a great addition for certain foamy fruits and vegetables. We recommend any anticipated needs such as an extra cleaning brush to ship free with the juicer. By owning the angel juicer new series model angelia 7500, you have taken an excellent step for your own health and wellness. series is called angelia 7500. In order to absorb the nutrition from food, you need to chew food well and use enzymes and acids in your saliva, pancreas, gall bladder and stomach to convert the food into absorbent liquid form. Angel juicer 7500 provides you that nutritious rich juice for fast absorption and assimilation by the body. Angel juicer 7500 series facilitate the problem most people have of not chewing their food well and long-enough for better digestion. Angel juicer 7500 series facilitate the problem of consuming large amount of calories by separating the pulp from the nutritious juice. Angel Juicer 7500 model angelia Main Features: Angel 7500 model angelia Juicer is the newest model in the series released in 2008 and has had minor, but important improvements since then. Angel juicer model Angelia 7500 basically has everything that model angelia 5500 has, but additionally it has the following important advanced features: Angel 7500 model angelia juicer has micro processor computer artificial intelligent sensor (MICOM) that function subtly and automatically to enable extraction perfectly. This feature would automatically release the action of the pushing forward of pulp, excess juice and nutrients momentarily to allow much thorough extraction of nutrients and juice and separation of drier poorer pulp (the user does not notice its regular action except may notice slight back-up of fine food mixed with juice momentarily. This is not like reversing a forward moving vehicle but resembles slight releasing of the acceleration to allow a safer distance away from the vehicle in front. This allows for best filtering of juice and best grinding to get most nutrient extracted resulting in slightly more juice, but much more nutritional value and an added safety feature. This advanced feature will not cause an unnecessary stoppage during juicing. Angel juicer series Angelia 7500 has automatic reversal functionality in case of emergency such as when foreign material injected or overly loaded, then it would sudden stop the machine as an extra layer of protection to the engine, gears, sensitive parts and filter. It may very slightly slow juicing, but it would provide higher nutrition, vitamin, minerals, essential amino acids and an essential layer of engine, gears and filter protection from damage. Additional to the above exclusive features, Angel juicer series Angelia 7500 has the following advanced features that are present in Angel juicer model angelia 5500: Angel juicer 7500 series Angelia juicer is made of Stainless Steel 304(18-8) for tween gears and filter. Angel juicer 7500 series angelia juicer has manual reversal to use when needed. Angel Juicer 7500 latest models is Angelia 7500 series use SHG technology (Shattering Helical Gear Technology) which focuses on the advanced shape and angles of the teeth of the tween gears. SHG may appear to make a minor difference, but provides profound nutritional juice content. SHG measures how much nutrition can be extracted depends on how subtly the juicer can grind. (angel juicer SHG Technology for the angelia juicer series) Angel juicer 7500 series angelia juicer uses Low Speed Cone Screw Technology (LSCS). Angel Juicer latest models Angelia 7500 series use MSE (Multi Step Extracting Technology). which makes high pressure while cone shaped screw are spinning slowly to get more nutrition and juice from vegetable and fruits. Angel 7500 newest model is Angelia 7500 juicer applies 3 steps extraction technology to to get more juice and nutrition: Angel juicers 5500 series angelia juicers uses reduction gear made of SCM4 exceptional durability heat treated as used in car transmission. Angel juicer models angelia 7500 uses a cooling system to last longer and t is the pride of the new angelia juicers series. Angel juicer 7500 uses FDA approved Stainless steel to use for food handling. Angel juicer 7500 series uses anti bacteria stainless steel. Angel juicer 7500 is truly a Masterpiece timeless and perfected design. Angel juicers series angelia 7500 juicer series have been exported world wide with very happy customers. Angel juicer 7500 like all the angel juicer series are easy to operate and quick to clean- up. Angel juicer new series angelia juicers are similar to other angel juicer series have ease and quick to assemble and operate. Angel juicer 7500 provide Protection of Motor made of special material to prevent the reduction of gear from damage. Angel juicer new Angelia 7500 uses water proof button to prevent electrical leakage. Angel juicer 7500 series offers child protection devices by preventing the juicer from working when it is dissembled. Angel juicer new series angelia 7500 new model has an automatic heat sensor that stops the machine automatically when overheated. Angel 7500 series angelia juicers has triple locker switch (Power and operation switches) attached to protect children from negligent accident. Angel juicer 7500 series new angelia juicers uses electromagnetic wave blocking system to shield user from electromagnetic with acquired Australian (C- Tick) and Korean (EM/ EMS) certificates. Angel juicer 7500 uses environmental hormone free stainless steel (unlike Plastic juicers. Angel juicers 7500 series angelia juicers gained approval certificates CE, ISO 9001: 2008, ISO 14001: 2004, KC, C-Tick, EM/ EMS. Angel juicer 7500 series angelia juicers has 3H engine grinding force. Angel juicer 7500 series angelia juicer’s engine is 120- 180 watts and 1/4 H. Angel juicer 7500 series angelia uses auger speed of 82 RPM which is very close to natural mouth chewing rate. Angel 7500 series has 42 mm diameter of feed chute. Angel juicer 7500 series angelia juicer weighs approximately 12 KG. Angel juicers 7500 series is designed for home use only and rated for about 30 minutes of maximum operation continuously before rest, cooling-off and cleaning. The best practice is when producing 1 to 2 containers of juice (a container is about 1000ml) to rest & clean the juicer. Angel juicer series angelia 7500 uses gears that are 220 mm in length. Angel juicer new series angelia 7500 uses gears that are 34 mm in diameter. Angel juicer new series angelia juicer 7500 can be ordered in 110-120 Voltage or 220 to 240 Voltage and either 50 Hertz or 60 Hertz Cycle. Furthermore, you can also specify the electrical cord plug shape for your country (read more). Angel juicer tries to include the desired cord type whenever possible. Angel juicer 7500 is available in 220V /50Hertz (common for Europe, Australia, UK). Angel juicers 7500 is available in 220V / 60 Hertz (limited countries use this. Angel juicer 7500 is available in 110V/ 60 Hertz (common in North America, Canada, Japan). Angel juicer 7500 is available in 110V/ 50 Hertz (limited countries use it). General Guide for Countries’ Electrical Cord Types General Guide for Countries’ Electrical Cord Types: Sample Countries Electrical Cord Types bases on previous customer orders: Cord "A" - Germany, Slovakia, Morocco (220 V. 50 Hertz) Cord "B" - USA, Mexico and Canada, Japan, Taiwan (Electricity 110V. 60 Hertz) Cord "C" or "F"- Denmark, South Africa (or E) and Russia (or F) (220 V. 50 Hertz) Cord "B" Israel (220 V. 50 Hertz) Cord "D" India (220 V. 50 Hertz) Cord "E" - France (220 V. 50 Hertz) Cord "F" - Norway, Sweden, Israel, Greece (220 V. 50 Hertz) Cord "G" - United Kingdom, Ireland, Malaysia and Singapore (220 V. 50 Hertz) Cord "I" Australia, New Zealand, Belgium , Grenada, Hong Kong (220 V. 50 Hertz) Cord "J" Switzerland (220 V. 50 Hertz) To Purchase the angel juicer new model angelia 7500 in 110-120V or for further information, please, click here To Purchase the angel juicer new angelia juicer 7500 in 110-120V or for further information, please, click here Angel juicer recommendation: We recommend you add the Stainless steel cup for the juice collection since it is properly fitted to offer better support for the long housing and gears. The optional silicon sealed pusher is a great addition for certain foamy fruits and vegetables. We recommend any anticipated needs such as an extra cleaning brush to ship free with the juicer. By owning the angel juicer new series model angelia 7500, you have taken an excellent step for your own health and wellness.